So get this. 99% of all SMS marketing messages are opened within 5 minutes or less. Isn’t that insane? Compare that to the open rates of email marketing, and there really is no comparison. For example, in email marketing, you’re lucky if 30% of your subscribers open and read your messages. Depending on what you’re selling and the industry you’re in, the open rate could be astronomically less. Now, pair that statistic with the fact that the average American looks at his or her phone 150+ times a day. What does that mean for you, the business owner? It means you have 150+ chances to engage with your customer throughout the day. Now, it goes without saying, ecommerce retailers tend to embrace digital innovation. Why? Because the type of person who shops online is also the type of person who isn’t afraid of technology. So, as an ecommerce retail store owner, you want to welcome these tendencies, and only take advantage of modern marketing methods that offer instant engagement. For that reason alone, we strongly suggest taking SMS marketing for a spin. Not only are the open rates drastically incomparable to any other method, but the immediacy and affordability of this mobile communication tactic make it borderline irresistible. And, on top of all that, you can easily collect mobile numbers via a web sign up form. This makes everything pretty automated, and allows you to grow your SMS marketing list with little to no problem at all. 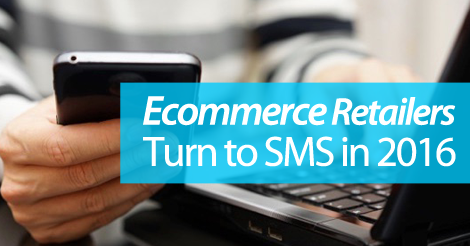 Partner up with an SMS marketing service for ecommerce sites. Give us a buzz at 1.800.688.6290 or head over to the pricing page and sign up for a free plan. Our educational resources are second to none, and the Slick Text platform is loaded with user friendly features that help you easily grow your list.